So did everyone have a good weekend? I did. Saturday was busy! I got up early, hit the Farmer's Market and ran some errands, and then swung by a work friend's housewarming party. Very cool to see it in person after seeing pictures of it. Then my husband surprised me by offering to take me to Duluth for dinner. Duluth is in Minnesota. It's also about two and half hours away, one way. But Lake Superior is my most favorite place on earth, so after he convinced me he was serious, I said yes. We had a good trip. Supper at Pizza Luce which was delicious, and then a quick spin to Park Point which is a beach right on Lake Superior so I could go stand in the sand and get my feet wet. Then home. But, it was fun to do something spontaneous. But, now back to normal. 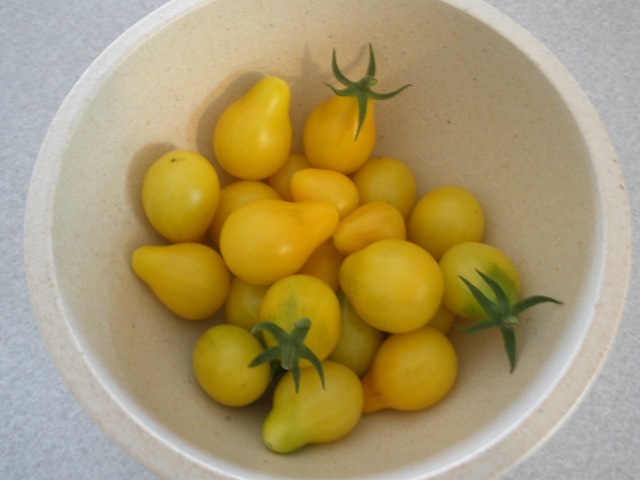 So, I mentioned my pear tomato was going crazy producing sweet little yellow yumminess. I love to pick them fresh off the plant and eat them when they're still warm from the sun, but there was so many, I had to do something with them. So I was thumbing through my recipes when I found this recipe for Greek Tomato Salad that I had made a couple times last year, so I decided to mix it up. Here's how it goes. In a bowl, whisk together the vinegar, oil, garlic, oregano, basil, sugar, salt, and pepper. Add the onions and pepper. Toss to coat. 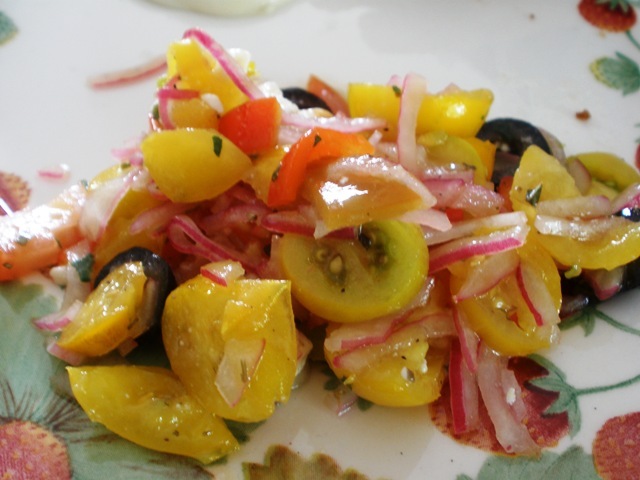 Stir in the tomatoes, olives, and feta. Cover and refrigerate for at least one hour. Serve with a slotted spoon. I did make changes to mine this time. First off, using pear tomatoes. I also used a raspberry wine vinegar because I didn't have any red. I used sliced olives, and red peppers because that's what I had on hand. You can add more or less of things to customize it to your liking. Serving it with a slotted spoon is a good idea, because it does get juicier as it sits.